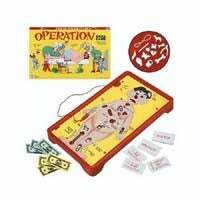 The next title to come out of the partnership between Electronic Arts and Hasbro is Operation Mania, a reworking of that surgery game we all used to play when we were kids — remember the poor patient with the light-up nose? The video game version seems to have added a bit more than just pulling out plastic organs from a precarious piece of human-shaped plastic machinery, though. You play as up-and-coming surgeon Dr. Humerus, who diagnoses patients with wacky illnesses at five different hospitals on his way to becoming an expert surgeon through microgames "reminiscent of the board game," but it's also got a story mode, upgradeable hospitals, and multiplayer. EA's launching it on its casual Pogo site in North America and Europe in August, and in a retail box in North America in September. Full details after the jump. REDWOOD CITY, Calif.—(BUSINESS WIRE)—What do you do when you are the doctor and someone comes into your hospital with butterflies in their stomach, water on the knee, and a frog in the throat? Operate of course! From EA's (Nasdaq:ERTS - News) casual games site Pogo.comTM comes OPERATIONTM Mania - a new twist on the classic OPERATION board game from Hasbro. Become an expert surgeon as you admit, diagnose and treat patients with the zaniest ailments in healthcare history. Play as Dr. Humerus who is an up and coming surgeon as he builds his reputation and is called in to save the day at five different hospitals in fun and wacky locations. Race against the clock to send a variety of patients including well-known and beloved Cavity Sam through a series of treatment stations. Perform surgery and become an expert surgeon by completing micro-games reminiscent of the board game. Be quick and effective with treatment before the patient's nose starts flashing and time is up! OPERATION Mania will be available online at Pogo.com in North America and the U.K. in August and at retail in North America in September for $19.95. Hospital management: Diagnose and treat both standard and emergency patients, and run them through a gauntlet of medical procedures including admissions, x-ray and of course operations! Unique hospital settings: Advance through 35 levels and five hospitals in different regions on a wacky continent. Micro-games: Show surgical finesse by completing micro-games with a steady hand. The bite sized challenges are reminiscent of the board game that people have come to know and love. Pogo General Manager Andrew Pedersen said, "We are delighted to bring Hasbro's OPERATION to the digital medium for the first time ever. Our goal was to stay true to a game loved by so many while giving it its own unique heart beat. By blending the urgency of time management with fun OPERATION micro-games inspired by the board game, we're giving people a new way to play and enjoy a timeless classic." "OPERATION Mania challenges virtual doctors of all ages to scrub in and test their operating room skills," said Mark Blecher, General Manager of Hasbro Digital Media and Gaming. "The Pogo.com team has done a fantastic job of taking the popular 40-year old brand and digitally bringing it to life by animating Cavity Sam, introducing new characters and settings, and creating more ways to play." For more information and to experience some of the best online games on the Internet, visit www.pogo.com. For screenshots and assets, please visit info.ea.com.